This scheme consists the upgrading of the N71 to Dual Carriageway from Bandon Road Roundabout to a new proposed roundabout at Garrandarragh. This scheme also includes a link road from the proposed new roundabout to Maher Lane. This scheme consists of a new road pavement, new public lighting, surface water drainage, new footpaths, new road markings, new road signage and the introduction of traffic calming measures in Ringaskiddy village from the speed limit on the Shanbally side of Ringaskiddy to the speed limit on the Haulbowline side of Ringaskiddy. This scheme consists of a new road pavement, new public lighting, surface water drainage, new footpaths, new road markings, new road signage and the introduction of traffic calming measures in Killeagh village from the speed limit on Castlemartyr side of Killeagh to the speed limit on the Yaughal side of Killeagh. 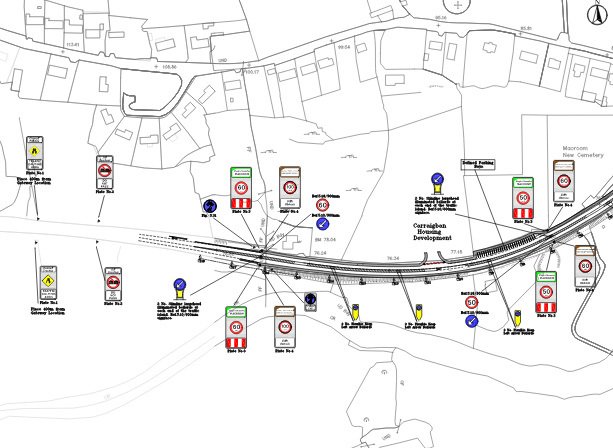 This scheme consists of traffic scheme and associated signing and lining through Castlemartyr and the overlay of existing pavement, upgrading of public lighting, upgrading of road drainage and new road safety barriers on a 5.5km stretch of the N25 from Lakeview roundabout on the Midleton bypass to Lough Aderra Lake. This scheme consists of new road pavement, new public lighting, surface water drainage, new footpaths, new road markings, new road signage and the introduction of traffic calming measures on the Western approaches of Macroom Town. Copyright 2019 – Cork National Roads Office.